Dhanya Vijayan wins prestigious ‘German Chancellor Fellowship for Young Leaders’ from the Alexander von Humboldt Foundation. Dhanya holds a PhD in Geography from Kannur University in India, and is currently working as a director at the Foundation for Environmental Research and Innovation, India. Her latest research focuses on sustainable natural resource management with a particular focus on river basin governance. During her PhD she examined micro-level natural resources and environmental management at the Centre for Earth Science Studies in India. She worked at the organization as a Junior Research Fellow from 2008 to 2014. For her achievements, Dhanya was awarded a Green Talent in 2012. The jury honoured her research in the area of sustainable regional development and her use of participative methods. After the award she did her research stay in Germany at the Artec Research Centre for Sustainability in the University of Bremen. She also participated in the South African Young Scientist Summer Program in 2013 and was awarded the German Chancellor Fellowship for Young Leaders. Dhanya Vijayan takes an interdisciplinary, participatory approach to natural resources management planning, putting her faith in micro-level solutions for sustainable development. Vijayan sees an intrinsic link between environmental protection and the eradication of poverty. “Survival needs compel the poor to continue to exploit already degraded ecosystems,” she explains. 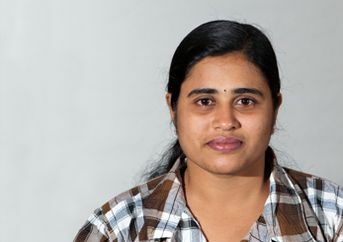 Her most recent research project in Kerala State, which involved environmental management planning at the micro level, has shown that participatory governance and stakeholder involvement at the lowest level are the most effective tools for raising awareness, generating rural employment, and effecting sustainable resource conservation and utilisation. Equally clear are her results, which include a long list of locally-driven achievements – from rainwater harvesting and pond restorations to modifying drainage systems. “Self-help groups are the key to meaningful environmental management programmes and poverty reduction,” says Vijayan, encouraged by the evidence of long-term environmental and socio-economic improvements. The jury commends Vijayan for her research in the area of sustainable regional development and lauds her use of participative methods. The jury describes her strategy of combining standard of living enhancement of local populations with eco-friendly natural resource utilisation as effective and worthy of further exploration.